Did you all have a nice Mother's Day? We had a very busy weekend! On Saturday, we celebrated my cousin's graduation from college and on Sunday, we went to church in the morning and had a Mother's Day lunch at my parent's house in the afternoon. After a week of rain, it FINALLY stopped and yesterday was gorgeous! I wore this quilted tassel blouse and floral cropped pants (both from LOFT) to my cousin's graduation ceremony on Saturday morning. This ivory blouse is lightweight and can be mixed and matched with so many bottoms for the spring and summer months! And of course, the tassels are adorable. The floral cropped pants are so summery and LOFT carries them in a variety of colors and patterns. This outfit is perfect for spring/summer events like graduations, bridal/baby showers, church events, lunch/dinner out, and more! The tassel top is currently on sale for $23.99 and the floral pants are on sale for $38.99 (no code needed)! Saddle bags are all the rage this year! I'm loving these fashionable crossbody bags and purchased my first one recently from Marshall's. This blush saddle bag is Franco Sarto and I got an awesome deal for it. I just LOVE Marshall's and T.J. Maxx! Blush and shades of pink are popular colors this season and I'm really liking the trend. When I saw this bag, I couldn't resist...and again, the tassel won me over! Sole Society has a similar saddle bag that comes in blush, gray, and navy (so cute!!). It's available at Nordstrom for $44.95. My earrings are the Eva Ear Jacket set from Stella & Dot. They are my first Stella & Dot purchase, and I love them! They're so versatile with interchangeable studs that can be worn alone or with the ear jackets. 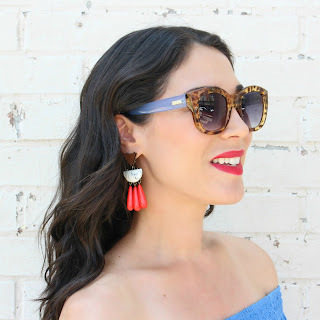 I'm wearing the blush studs in these photos. These ear jackets are unique and go with everything! Definitely check out Stella & Dot...they have gorgeous jewelry pieces! I got these cognac wedges from Kohl's last summer and have gotten a lot of wear out of them. Wedges are very trendy again this summer, and come in all kinds of styles! Kohl's has a similar version right now that come in black and cognac and are on sale for $34.99 (plus when you shop with coupons you can get them for even less)! Shop the Candie's Wedge Sandals here. So, which of these summer trends is your favorite?? 1 Peter 5:7, Cast all your cares on Him, because He cares for you. Oh my goodness these are the cutest ear jackets!!! Love the floral pants with the tassel shirt too. Perfect for spring! I LOVE those pants!!!!! They are gorgeous!!!!! I LOVE the tassel shirt, you'll wear that so many times!! The floral pants and those S&D earrings are both pulling at my heart (and purse!!) the Saddle bag is the perfect finishing touch!! Super cute earrings!!!! Love the printed pants too. Haha I LOOOOVE the bag! LOFT does have adorable things right now...I've really liking these patterned pants. The fit is great! I saw this on FB the other day. Great look and I really love those wedges. LOVELY! I think I told you on IG how much I LOVE that bag!!! Such a cute look! Love your bag too! I love that saddle bag! So chic and pretty on you! Tamara, I love your new Loft pieces, the earring jackets and that bag. I need your bag and blouse in my closet ASAP. I am a huge fan of Loft cropped pants too so no wonder I love yours. Great you enjoyed your Mother's Day weekend! Thanks so much, Ada! I hope you enjoyed your Mother's Day weekend, too. I just added two posts to your link up! Fabulous look all around! The floral pants are adorable and your top looks so lightweight and easy to style. Very nice bag! I also love T.J. Maxx and Marshall's - they have such great deals. Have a wonderful weekend, Tamara! I am LOVING that saddle bag! Great style!